This morning I ran into the Google Street View data collection car. Unfortunatelly, I only had my phone with me, so the pictures are not as nice and bright as I would have liked them. Anyway, most of the sensors could be identified. The most interesting elements are the three laser scanners. A tutorial for them can be found here . The scanners are essentially laser range finders combined with a rotating mirror to achieve a scan line. The laser shoots a pulse and the sensor measures how long the return pulse, reflected somewhere, takes and calculates the distance. This is done a couple dozend times per second while the mirror rotates. The two scanners left and right are mounted vertically so that they scan the height of the buildings, trees, whatever is in range. 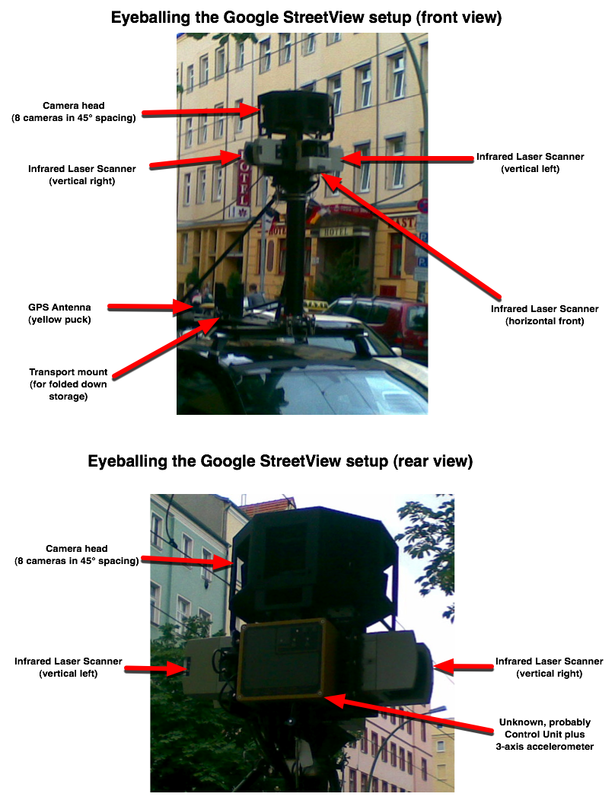 The front scanner is mounted horizontally, so it records the general layout of the street. All scanners can scan up to 180 degrees and up to 80 meters range (depending on reflexivity of the scanned objects). The number of scan lines per second is dependent on configuration and precise type of the scanner, but it is certainly sufficient to built a 3D model of the street. Further data that – at least in theory – can be extracted from the scans is stuff like number of cars parked, how many trees are there and where etc. The unknown element is the box with the yellow frame on the rear side. Before the car drove away from the coffee stop, I could see LEDs switching from yellow and red to green, after a bit of blinking back and forth. The writing on the box seems to suggest some sort of 3-axis accelerometer. Lets see if higher res pictures surface in the next days. Update: a little bird told me that some of the StreetView cars have been fitted with WLAN receivers, so location and range of wireless networks can be recorded as well. Which would explain how Skyhook Wireless got some of its data for locationing via WLAN networks. This entry was posted in General on 7.7.2008 by frank.